Here’s how to work in Brick Stitch. This video follows on from the Ladder Stitch tutorial: I give a demonstration of Brick Stitch worked from a Ladder Stitch base. Brick Stitch gets its name from the pattern formed by the beads – like little house bricks, with each row of beads offset from the row below by half a bead’s width. Like Peyote, Brick Stitch is great for weaving in a pattern; there are plenty of blank Brick Stitch grids available on the web for you to print out and then draw some patterns for beading, then simply select the bead colours and pick up the appropriate bead for each stitch – if you’re unsure of what I mean, I will be publishing a video showing how to do this. Beadwork made in Brick Stitch has a good solid quality to it, with more flexibility in the plane at right angles to the holes, i.e., if you made a very long foundation row of Ladder Stitch to start (let’s say to go around your wrist), then worked 10 rows for the width of a bracelet, the band you make would be soft and flexible enough to sit nicely around your wrist. If, however you started with a foundation row of 10 Ladder Stitched beads, then worked enough rows to cover the distance around your wrist, the resulting band would be a lot stiffer. In fact it would be awkward to bend in that direction. This is useful to know because you may want to make a stiff piece of beadwork for something structural, so now you’ll have a good idea as to how to tackle it! There’s plenty more to know about Brick Stitch, but that’s for a later video. Byzantine Cross, made in size 15º Miyuki seed beads (24K gold plated), embellished with Swarovski crystals. When I teach the Byzantine Cross workshop we work in size 11º seed beads, although the pattern also covers the design in sizes 8º, 15º and Czech Charlotte 15º. 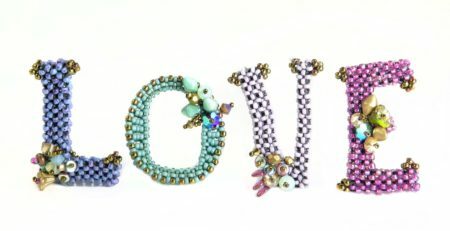 The instructions will be available soon in my online Beadschool shop. 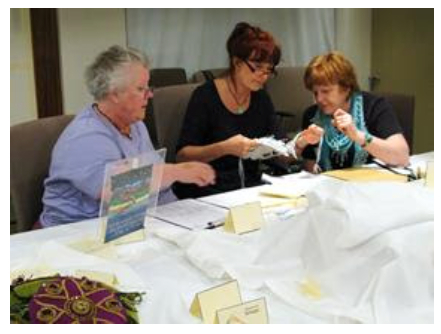 The next Byzantine Cross workshop is at Stitchncraft – 4th October, 2013. This is absolutely the best place I’ve been to that teaches stitches so well!! I’ve been to other website tutorials and just left still confused and a half finished product which I had to rip apart anyway. thank you for your clear tutorials!! I will be attempting my first earrings set.! !